Make a statement everywhere you go, from the ski slopes to city streets, in this exotic boot. A haircalf foot and sustainable curly lambswool exterior combined with wool and sheepskin linings make this boot amazing inside and out. I love them. I'm glad i chose the wine color because there beautiful. I don't even have WORDS to describe how beautiful and comfortable these are. I bought 2 other colors on Amazon that are hot pink and blue and I can't get enough of them. They are a show stopper so if you don't like attention these are NOT for you. These Are Definitely, A ShowStopper. These boots are so on point. I like that the boots looks great and their very comfortable. I appreciate that it's real lamb. Plus, I appreciate the rubber at the bottom for none slip. 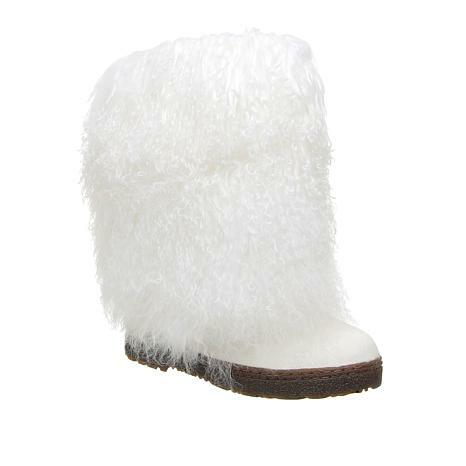 Plus, these boots, has that Playful ShowStopper vibe. 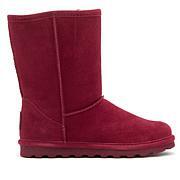 It would be nice if BearPaw would make matching hats or coats and bring more colors for next winter. I'm so very please and I'm glad I ordered these ShowStopper boots. I definitely recommend these boots. 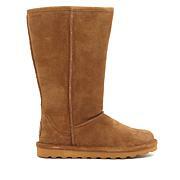 Thank You BearPaw and HSN For Another Great Buy. 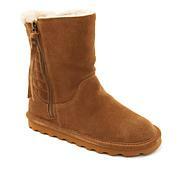 I love these boots and they are so comfortable.